The safety and enjoyment of Florida’s public beaches are affected by changes in tide and surf conditions. To minimize the risks of drowning or serious injury, the Florida Coastal Management Program worked with the Florida Beach Patrol Chiefs Association, the United States Lifesaving Association (USLA), and the International Life Saving Federation to develop a uniform warning flag program for use by Florida’s beachfront communities. Why does Florida need a uniform warning flag system? Many residents and visitors travel to different parts of the state to enjoy Florida’s wonderful public beaches, and many beach communities post warning flags. 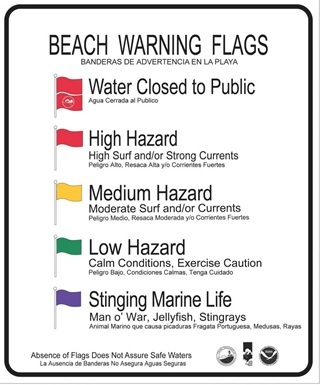 Differences in flag colors, sizes and symbols from place-to-place can confuse beach goers, thereby decreasing the effectiveness of efforts to improve public safety. The Florida Legislature decided that a uniform flag system would provide the best measure of safety and, in 2005, amended Section 380.276, F.S., to require that all public beaches displaying warning flags use only the flags developed for the state’s warning program. 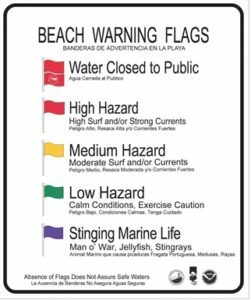 Florida’s beach warning flag program uses flags in four colors accompanied by interpretive signs along the beach to explain the meaning of each color. To the extent funds are available, warning flags and interpretive signs are provided free of charge to local governments that provide public beach access. The communities that receive the free warning flags and interpretive signs are responsible for the installation, proper use, and maintenance of the flags and signs. Are flags used to warn of the presence of rip currents? The beach flags provide general warnings about overall surf conditions and do not specifically advise the public of the presence of rip currents. However increasing awareness of natural conditions which pose a significant risk at the beach, such as rip currents, is a critical element to improve public safety. Therefore in addition to this warning system, the FCMP also distributes rip current educational signs to local governments and public parks in the state of Florida free of charge. Since 2004 FCMP has distributed these comprehensive national signs that were developed through the combined efforts of the National Oceanic and Atmospheric Administration’s National Weather Service (NWS) and SeaGrant, and the USLA. To further your understanding on the dynamics and dangers of rip currents, FCMP encourages you to consult the professional advice provided by the NWS and the USLA. How many signs are available? Local governments can request any number of warning flags and interpretive signs needed to place flags and a sign at each public beach access location identified by the local government. Each year, flags and signs will be provided by the Florida Coastal Management Program until the funds reserved for the program have been expended. What are the dimensions of the flags and signs? Each flag measure 29.25”H. x 39”W. The signs are 30” x 36”. Order online between November 1st and February 1st each year.